If we quote other authors this may not be our opinion but we consider them of course qualified statements. The HP Photosmart 8750 Professional is the big brother of the HP Photosmart 8450 that we reviewed some months ago. The 8750 uses essentially the same printing technology as the 8450 and also the driver settings (for Windows at least) seems to be the same. Installation as a USB printer was simple and fast. Also the installation using the network worked fine. The network option allows you to use the 8750 from multiple computers (software has to be installed on all of them). First we planned to use a different PC as a print server but then found the direct connection via network easier (no need to power up a different PC). Switching cartridges is simple but you may lose some ink. Because we still have some cartridges #99 and #96 we will first use them off and also may consider to use #96 "Black" instead of of the Gray cartridges for pure color photos. Note: We have a friend that always complained about his other printers (clogging, not so good standard profiles). He seems to be the first time happy with a printer: his 8750. 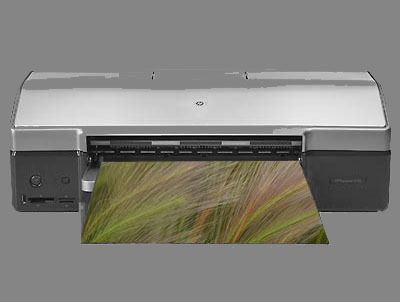 We think the HP printers are best used for glossy and semi-gloss/semi-matte media (as here you get the full longevity). Our favorite is the HP Premium Plus Photo Satin (also called Soft Gloss).